Here at Telarus, we pride ourselves on our ability to partner with diverse and unique companies within the telecommunications industry. Our in-house IT staff has created multiple award-winning software solutions that make it easy to do business with us, whether you're a one-man-shop or a Fortune 100 company. And when doing business is easy, everyone wins! Below we have listed the four ways in which we partner with companies and individuals alike. Use the links provided to learn more about the programs and software we have created to expand your business. 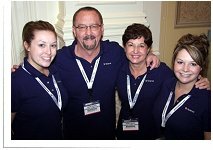 Melissa, David, Cheri, and Teresa Leach work together to contact, follow-up, renew contracts, and up-sell new services to prospects sent to them by Telarus. The real strength of Telarus, the parent company of ShopforMPLS.com, resides in the quality of agents we work with. This is not clich? Telarus has attracted some of the brightest, honest, and most integrity-filled agents in the industry. This "honor code" allows agents to partner with one another to close deals and split the commission accordingly, it allows them to receive warm leads generated by other agents, and it allows them to offer honest feedback to the IT staff at Telarus on the performance and utility of the software we create. Telarus is more than a "contract shop" that pays the "highest commission" and offers the "lowest rates". We offer our agents true value: software, support, and a sense of family. If you are interested in becoming a member of the Telarus agent family, please call (877) 346-3232 for a personalized tour of the agent back office and explanation of our award-winning program. The main focus of Telarus' VAR Network is Value Added Resellers and Network Integrators. We understand that a meaningful relationship consists of more that just an occasional plea for new business. The VAR Network program allows our agents to recruit VARs into one main pool, and drives equipment leads to these VARs based upon their individual qualifications and preferences. We currently specialize in generating leads for VARs who service Avaya, Cisco, NEC, Mitel, Nortel, ShoreTel, Polycom, and more. If you are interested in joining our VAR Network, please call (866) 466-0374 or join online. If you maintain your own master agency and are feeling to pressure to provide your subagents with top-of-the-line back office software and stable carrier contracts, Telarus is the perfect place for your business. We have invested millions into the development of MARS (Master Agent Reporting System) that you can private-label and roll out to your network of agents and our carrier contracts offer you a safe haven. If you are interested in our Master Agent Program, please call (877) 346-3232 for a detailed one-on-one run-down on this progressive program, including a WebEx tour of MARS. The Telarus Affiliate Program was created with the internet marketing expert in mind, not to mention people who are naturally gifted at social networking. Which ever the case may be, Telarus pays affiliates to generate leads for our Product Specialist agents to close. To accomplish this, Telarus has created XML plug-in technology that allows all of our affiliates the ability to add our GeoQuote real-time price tool to any existing web site (that runs PHP or Cold Fusion). We have also created an extensive library of Search Engine Optimization articles authored by our co-founder, Patrick Oborn, SEO expert. If you have a web site and/or relationships and you would like to begin earning a residual commission (and spiffs) by generating telecom service and equipment leads, you've come to the right place!